← @JuliensAuctions a customer wants a refund! Stop ignoring her emails! Darren uses charities as a marketing ploy, and frequently tells his consigners to donate to charity so that things are not “questioned”. 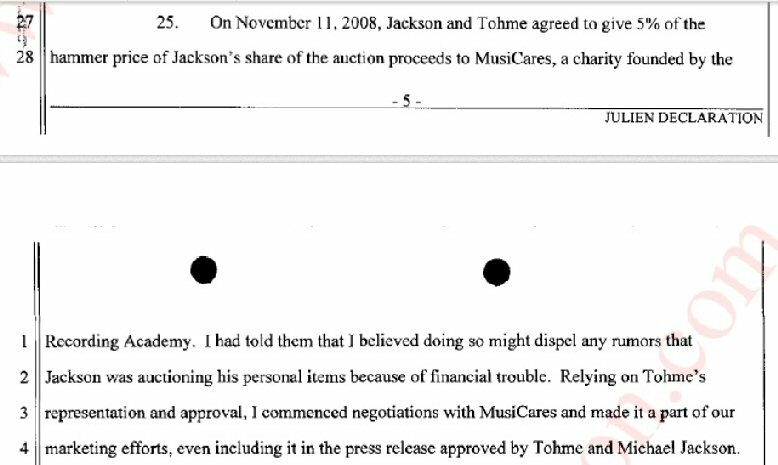 In his own declaration (a legal document filed with the Los Angeles County Superior Court), http://www.scribd.com/doc/112852668/Declaration-Darren-Julien bottom of pg 5, he tells Tohme Tohme (someone Jackson used as a mgr at times) that they should donate an amount of the proceeds to charity to throw off any rumors that Jackson is selling his personal belongings because of financial problems. Later on, in this same declaration he provides an email where again, he says the same thing: “This helps fans rationalize…” “… will garner additional press and give a good feeling to fans…” Did you feel good fans??!! !